A quick post today, as crafting is limited to what I can do sitting on the sofa, spending most of the day keeping Mum company. The baby blanket is almost finished. I'm just adding the border. I will make a little green and white teddy bear to go with it but, since the baby isn't due til the Spring, that can wait til after Christmas. My flutterby, short attention span means I have to have more than one WIP on the go, so I'm going to knit another pair of socks as a pressie, for DD1, along with her quilt. I need to get cracking with this, which is growing, but slowly. Meantime, now the weather has finally turned, Rosie is spending more of the day indoors. She's still choosing seemingly uncomfortable, precarious places to sleep - but at least she doesn't have as far to fall as outside, on the pergola or log pile! WOYWW? Click the button on my side bar and, compliments of the lovely Julia, visit amazing crafters all over the globe who get together on Wednesdays for a virtual cuppa. I hope to visit as many of you as I can over the next few days. Thanks to everyone who visits me, and takes the time to leave a message. What IS that cat doing, lol??! They do choose some funny places to lie, don't they? My two do the same! The blanket is really pretty and the quilt is zooming along! I've got a flutter by mind too, so we're in good company!! Wish I had made as much progress as you on ANY of my projects. Still love the blankie and the quilt is coming along nicely. Your projects are coming on nicely. I love the quilting! And I'm looking forward to seeing the teddy to go with the blanket. 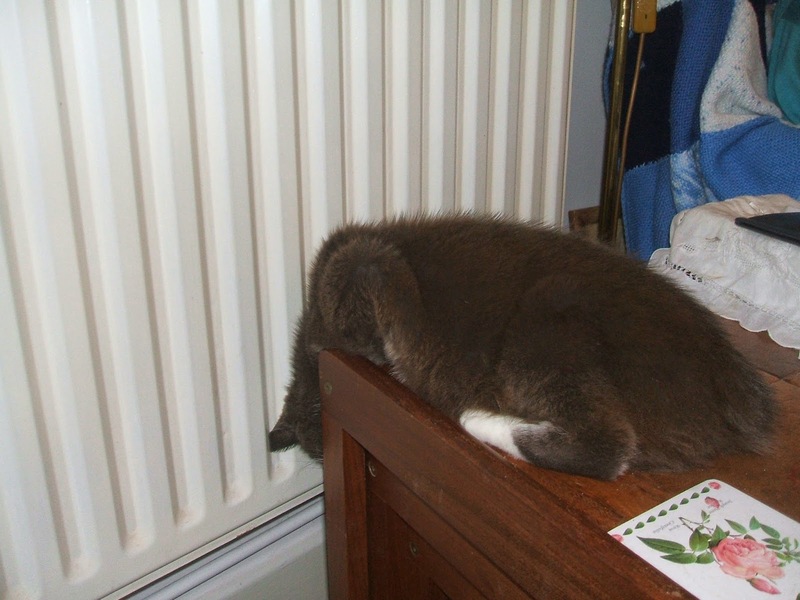 Yes, cats do sleep in weird places.... Is she asleep in the picture or is she just peeping? Short attention span or no, you sure get a lot done! What a silly puddy tat, is she really asleep like that? Thanks for your visit to my blog earlier. Hi Chris, Happy WOYWW. Thanks for visiting, I will try and have a nice time in Devon, I mean nice hotel, 3 course dinners, theatre one night - lets hope my back behaves this time round! You are still busy making wonderful things I see, and as for cats sleeping awkwardly - one of our dogs does too! Gorgeous blanket Chris, good luck with the patchwork. That's cats for you, they do what they like Lol! The baby blanket is gorgeous! 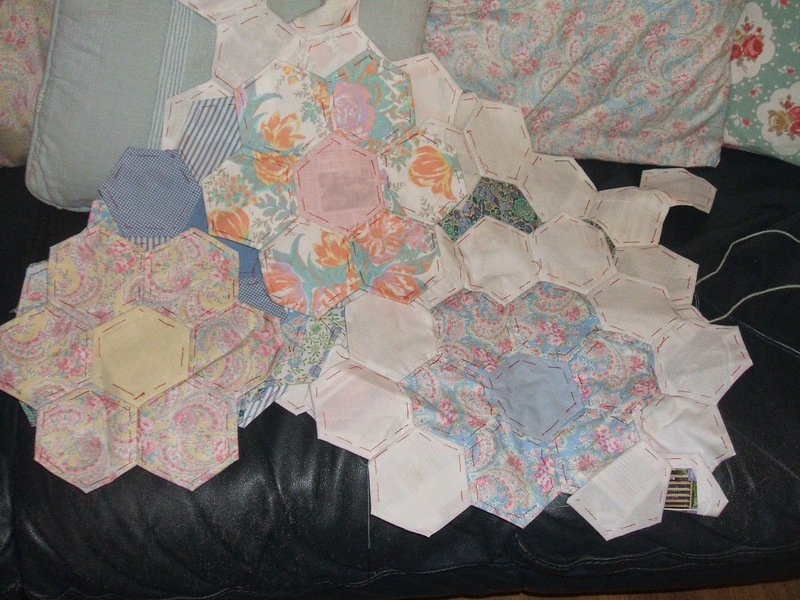 And the hexagon quilt is too! Our cat must like her comfort as she's never slept like yours! LOL! Thanks for popping by and Happy WOYWW! Thanks for visiting. Love the cat. That photo makes me want to hug it. :) Beautiful blanket and quilt. I really admire those who can quilt. I've tried it and made a mess! Aren't cats funny, they pick to oddest places to zonk out! I envy anyone that can make lovely things out of fabric or yarn, me it's a lost cause! Aww Chris, your lovely kitty! They are funny. Until recently, Beatrice preferred to spend her evenings asleep on my kitchen perching stool (vinyl seat on a slight slope) to cuddling up with me on the recliner! She's now got a bit more interested in me but that's probably because the weather is colder. (My job in life: kitty warmer.) Phoebe's latest fad is to sleep on the arm of my chair, leaning her not insubstantial bulk on my left arm. Makes typing and other stuff rather difficult! The baby stuff you are making is just gorgeous. Well done! Thanks for your lovely comment. Hopefully my blue badge will come before the old one expires. It's been a real sweat applying for it. Why they need all this identification when all they need is my NI No. and they can contact the DWP and prove I'm on higher rate mobility benefit and automatically entitled! I think they make it as difficult as possible, and I got really stressed out over it yesterday afternoon. (Silly me.) I need need need more time and energy to do what really counts in my life - ART!!! The quilt and afghan are lovely! Hope your mom feels better soon. Loving the baby blanket and your patchwork. Hope your mum is better soon. sorry I am late getting around for WOYWW. Yesterday was just one of "those" days and today not that much better!. 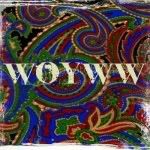 Anyway thanks for dropping by my Blog and leaving a comment...yep I too flit from one craft project to the other like you. The blanket is looking awesome!! Rosie is CUTE!!! Rosie knows a good thing... stay inside where it's cosy and warm. That's my kind of philosophy. It always makes me chuckle seeing the positions cats and dogs sleep in, I wish I could sleep so easily! What a beautiful baby blanket! A matching teddy bear is such a great idea! Knitting is what I do once I'm home from work. I can sit in my comfy chair and relax. I started a scarf and unfortunately don't have enough yarn t finish it and I couldn't find it yesterday in the store - now that sort of thing is very frustrating! The quilt is going to be gorgeous! Your blanket is coming along beautifully! Plenty of time to finish it but yes, Christmas will soon be here! Glad to hear you're making more socks, that gladdens my little heart, lol! You should come and join us on Ravelry! Oh I forgot to mention Rosie! What a cat, lol! Is that kitty actually asleep in that precarious position? Gorgeous baby blanket, looks so soft and cuddly. Sorry it took me so long to return your visit this week. 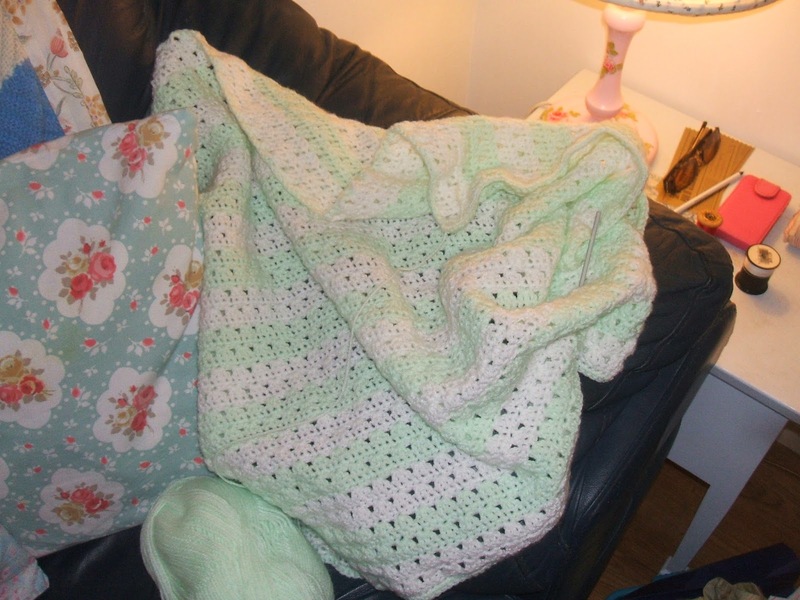 Love that blanket, can you send me details of where to get the pattern please? my youngest daughter has a secret and I would love to make one of those for her. The quilt looks like it will be beautiful when it is complete. Cats are just so comical, this sleeping position is case in point! Chris, such a lovely baby blanket, and a knitted teddy to go with it will be wonderful, and I like your patchwork, keep intending to have a go myself, but never seem to get round to it. That puss cat of yours is so beautiful, is she cuddly, she just looks ripe for a big hug. Thanks for popping by my Woyww, and glad you got a smile out of me bailing out the loo with a yogurt pot. Not planning to give you anymore opportunities to smile about that. Beautiful blanket and quilt - I can't do anything like that and admire those who can! Thanks for the comment you left for me.